I have been posting excerpts from Susan Fenimore Cooper's insightful book, Rural Hours. She wrote about the natural history and agrarian culture around her home in Cooperstown N.Y., circa 1850. Today's excerpt refers to making maple sugar, not syrup. 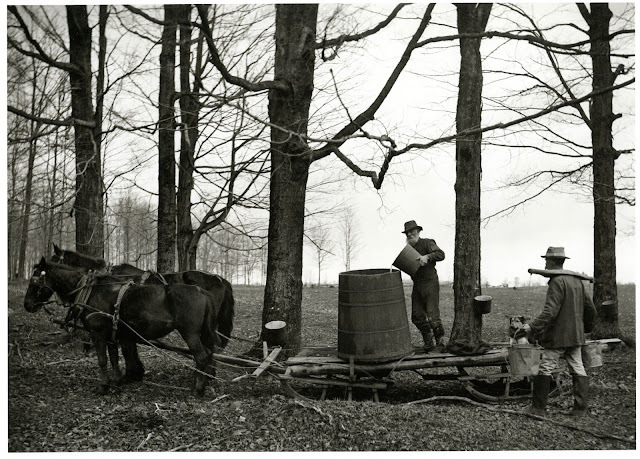 The old-timers made sugar with their maple because sugar was easily stored and transported, and it would keep indefinitely. Syrup will keep too, but it needs to be bottled into a sealed jar. Canning jar "technology" was not around in 1850. Saturday, April 1st—Fresh maple sugar offered for sale today. A large amount of this sugar is still made in our neighborhood, chiefly for home consumption on the farms, where it is a matter of regular household use, many families depending on it altogether, keeping only a little white sugar for sickness; and it is said that children have grown up in this county without tasting any but maple sugar. Some farmers have a regular "sugar-bush," where none but maples are suffered to grow; and on the older farms you occasionally pass a beautiful grove of this kind entirely clear of under-wood, the trees standing on a smooth green turf. More frequently, however, a convenient spot is chosen in the woods where maples are plenty. The younger trees are not tapped, as they are injured by the process; it is only after they have reached a good size—ten or twelve inches in diameter—that they are turned to account in this way; twenty years at least must be their age, as they rarely attain to such a growth earlier; from this period they continue to yield their sap freely until they decay. It is really surprising that any tree should afford to lose so much of its natural nourishment without injury; but maples that have been tapped for fifty years, or more, seem just as luxuriant in their foliage and flowers as those that are untouched. The amount of sap yielded by different trees varies—some will give nearly three times as much as others; the fluid taken from one tree is also much sweeter and richer than that of another; there seems to be a constitutional difference between them. The fluid begins to run with the first mild weather in March; the usual period for sugar-making is about two weeks—one year more, another less. 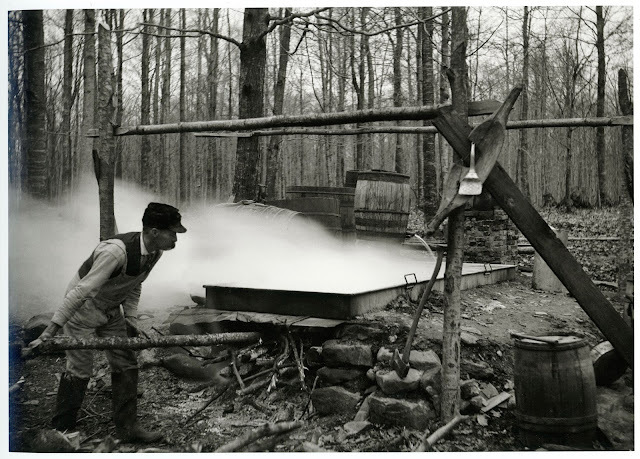 Two or three hundred trees are frequently tapped in the same wood, and as the sap is running, the fires are burning, and the sugar is boiling all together, day and night, it is a busy moment at the "bush." The persons at work there, usually eat and sleep on the spot until their task is done; and it is a favorite rallying place with the children and young people of the farms, who enjoy vastly this touch of camp life, to say nothing of the new sugar, and a draught of fresh sap now and then. There are at present farms in this county where two or three thousand pounds of sugar are prepared in one season. Formerly much of our sugar was sent to Albany and New York, and a portion is still sold their to the confectioners. During the early history of the county, rents were usually paid in produce—wheat, potash, sugar, etc.,—for the convenience of the tenants, and it is on record that in one year sixty thousand pounds were received in this way by the leader of the little colony about this lake; a portion of it was refined and made into pretty little specimen loaves at a sugar-house in Philadelphia, and it was quite as white and pure as that of the cane. Maple sugar sells in the village this year for nine cents a pound, and good Havana for six cents. Interesting about different trees yielding various degrees of sweetness. I also didn't know the minimum age of a tree that could be tapped. Now I'm thinking of the saying, "Tapping the resources..." perhaps it came in part from the practice of tapping trees? Also, the derogatory use of calling someone a 'sap'. Elizabeth L. Johnson said, Joy, thanks for the history about phrases; so interesting! I'm really enjoying Cooper's observations. They sound "homey" and wholesome---people were mostly still connected to the land. It makes for a different kind of American.